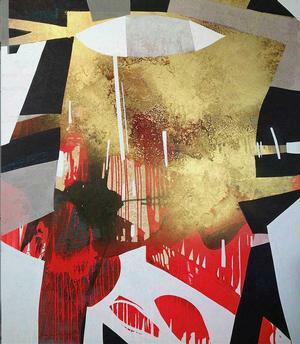 Painter Erika Ranee is on the cusp of a second coming of sorts. After earning an MFA and a promising start to her career in the mid-1990s, she settled into a self-imposed hiatus for nearly a decade. 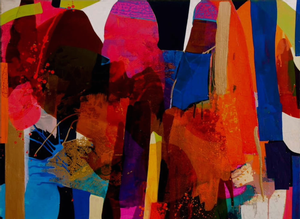 During that period, she refrained from showing and re-emerged having replaced her figurative painting style with a new passion for abstraction. 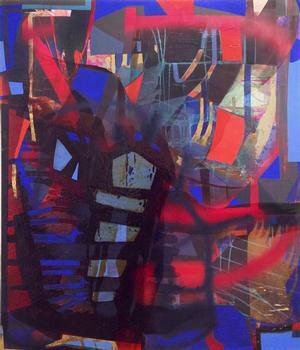 The pivotal moment came as she struggled with a painting during a residency in Vermont in 2007. “I was having such a relaxed time painting every other space of that canvas except for the large looming figure hogging a third of the picture plane. It held me back from completing the painting. And the narrative that I created to fit the composition was also holding me back. Becoming a much more intuitive painter, Ranee found a voice in her extremely physical approach to abstract painting. With the transition to non-representational approaches, the role of chance has increasingly played a part in Ranee’s process along with a less rigid approach to research. This dance often situates Ranee in a negotiated space between surrender and control — a negotiation that now includes creating small-scale work in an effort to expand and deepen her expression. 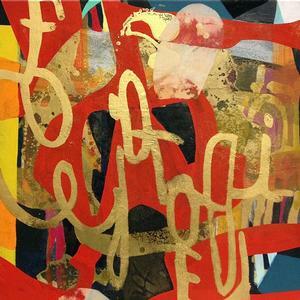 Ranee’s abstract work is informed by snippets of overheard conversations, sentence fragments, colloquial phrases and day-to-day observations mediated through the audible world. These verbal cues are often recorded in marks and the structure of text as a starting point and eventually evolve into a transformation of words into energetic articulations that materialize as shape, color and texture within a compositional framework that never repeats. Ranee’s canvasses become such a thorough record of her mental and physical exploration that she views them as “journal entries.” The exploration involves several stages. “I find that each canvas can work and play off another as a continuing dialogue. “Sometime the palette of one painting will work its way into a neighboring painting. Usually when I’ve built up several layers, I take stock of what’s happening. “At this stage things slow down considerably and I can spend hours just looking. Each painting becomes a puzzle to solve and organize. I begin to edit some areas and in some cases I’ll add more information—more text, or other ephemera. 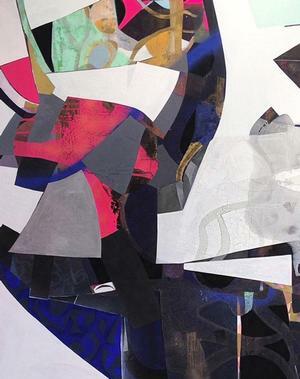 Although each of Ranee’s pieces is an object all its own, what does remain consistent in her work is her transformation of sound, word, text into abstract form, as well as a few signature materials that appear frequently in her work. Her characteristic media include the use of gold pigment, standard grade shellac paint and a special artisan acrylic she has remained loyal to for over 20 years. Ranee is trying to break up with gold, but the love affair has proven to be long-lasting. “I don’t have any interest in wearing it (gold) — I don’t like the way it looks on me, or the idea of ordaining my body with a gold piece of jewelry, but I find it’s especially mesmerizing on buildings and in paintings. There’s an inherent boldness to it the way it shines like the sun. Its propensity to be ritualized and feverishly revered in Indian culture, Italian culture, American and countless other cultures. One thing that is immediately noticeable in Ranee’s work is a conversation situated in polarity. The interplay of gloss and flat paint, thick and thin layers, immediate and deliberate marks, biomorphic shapes and straight lines, all speak to an awareness of extremes that is actually rooted in the interplay of her rural upbringing and urban adult life. Ranee has had a wide range of inspirational influences throughout her life beginning with family in the form of her aunt’s forays into macramé and her grandmother’s knitting, sewing, quilting and needlepoint. 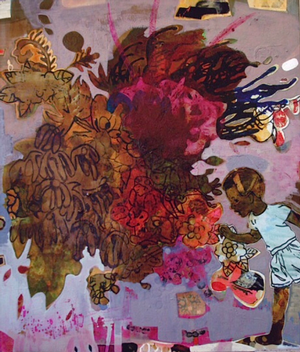 The long-term mentorship of the esteemed art historian and artist David Driskell also has been an importance influence. And numerous visits to Paris’ Musee d’Orsay, Louvre and Rodin museums during her senior year abroad in college left an indelible impression on Ranee. These experiences along with encouragement from a close friend shifted her post-undergraduate professional aspirations from law to art. Although Ranee says, “I’m naturally drawn to a dramatic aesthetic—like painters from the Baroque period. One of my favorite Baroque artists is Caravaggio,” she had a visceral response, early in her art study, to Willem deKooning’s Woman series. She was impressed by deKooning’s energetic application of paint in this early 1950s series. She also was impressed by the gestures of Karel Appel and Jean Michel Basquiat, as well as the colorplay and storytelling of Bob Thompson. And it was in these artists that Ranee found the inspiration she needed to explore her own personal style during her first few years of art school. As far as Ranee’s admiration for her contemporaries, she says the list is endless, but includes Ellen Gallagher, Chris Ofili, Keltie Ferris, Mark Bradford, Mike Cloud, and a new virtual mentor, she has not yet met, Stanley Whitney. Up next for Erika Ranee is a 2016 solo show at LMAK Gallery in New York City. 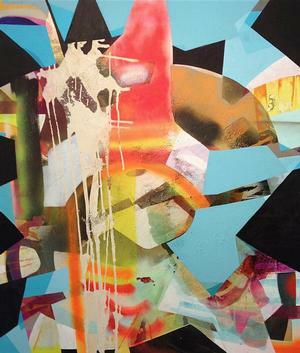 The show will include several large-scale paintings and a mix of medium and small-scale works that will showcase the expansion of her materials repertoire to resins, oil paint and spray paint in large-scale works, and inks, gouache and crayons in small-scale pieces. Author’s Note: This article was prepared via studio visit with the artist and Q&A email in September 2015. Diana McClure is a writer, photographer and cultural producer based in Brooklyn NY. 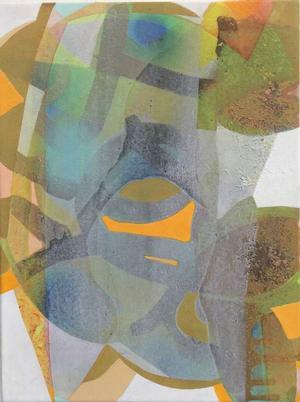 Erika Ranee received a BA from Wesleyan University in 1987, and a BFA from the School of Visual Arts in 1990 and MFA from the University of California, Berkeley in 1993. She was a recipient of a New York Foundation for the Arts (NYFA) Fellowship in Painting and attended the Skowhegan School of Painting and Sculpture early in her career. 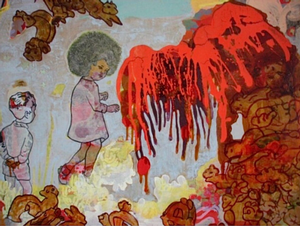 More recently, she was a 2009/2010 Artist-in-Residence at the Abrons Arts Center and was awarded a 2011/2012 studio grant from The Marie Walsh Sharpe Art Foundation. Her work has been shown in exhibitions in a variety of spaces, including the Bronx Museum, SALTWORKS Contemporary Art, the Arlington Arts Center, Slate Gallery, Artspace, the Allegra LaViola Gallery, and most recently in The Last Brucennial 2014 and LMAKprojects.